It took me a long time to warm up to spaghetti squash. I think it’s because I had unfair expectations. People say they eat it because it’s just like eating spaghetti (!!! ), but those people are liars because it’s really not like eating spaghetti. It’s like eating squash in the shape of spaghetti. Which is good! But it’s not spaghetti! Please don’t lie to me about pasta! The other reason I was on the fence about spaghetti squash was the wateriness. Sometimes spaghetti squash releases a lot of liquid after you’ve cooked it and this can pretty much ruin any recipe you’re using it in. I searched the web for tips on how to prevent this, but I couldn’t find much about it. Through trial-and-error, I’ve learned that roasting the squash, instead of steaming or microwaving it, results in the least amount of water, and that when you’re pairing the spaghetti squash with a sauce, you need to make it a little bit stronger than you normally would so it’s still flavorful when tossed with the squash. For this particular sauce, I made some slight adjustments to a kale pesto that Kare from Kitchen Treaty had posted as part of a White Bean & Kale Pesto Dip recipe. Basil pesto would be a solid choice too if you don’t want to go the kale route, but since it’s fall and basil is no longer growing right outside my kitchen (sad! ), I went with kale. Although I halved other ingredients in the pesto, I kept the amount of garlic the same to compensate for any water the squash released after being tossed with the sauce. I topped each plate with toasted walnuts and sun-dried tomatoes; if you have a little more time, roasted broccoli would be a great addition to this dish too. I’m not going to tell you it’s going to curb your craving for pasta, but this recipe is really good. So good that maybe you’ll forget you had a pasta craving in the first place. That works too, right? Roasted spaghetti squash tossed with a garlicky kale pesto and topped with sun-dried tomatoes and toasted walnuts. Place the spaghetti squash halves cut-side-up on a baking sheet and spray the tops with oil. Bake until tender and just beginning to brown on the edges, about 40 minutes. Allow the squash to cool slightly; if liquid has collected in the centers, drain it off, then scrape out the insides with a fork and separate it into spaghetti strands. While the squash is baking, combine the kale, 1/4 cup walnuts, cheese, olive oil, lemon juice, and garlic cloves in your food processor. Process until smooth. Season to taste with salt and pepper. Toast the remaining walnuts and set aside. Toss the spaghetti squash with the pesto in a large bowl. Divide onto 4 plates and top each with the toasted walnuts and sun-dried tomatoes. The squash I used was 5 pounds. If you can’t find one that big, you could buy two or three smaller ones, but note that they may need less time in the oven. I lived on campus after sophomore year in college on a tiny tiny research stipend and made something just like this for like, 80% of my dinners. There was a farm stand a few blocks away that had spaghetti squash for like, 40 cents a squash. I think I 1) turned yellow and 2) lost 10 pounds eating nothing but spaghetti squash & kale. Yes, zucchini would definitely work too! If you add enough garlic to anything – I’ll likely eat it and love it! if you spray the spaghetti squash and bake it cut side down, no liquid occurs and the squash is dryer if you leave it long enough to turn a golden brown on the outside! Enjoyed your recipe & the comments following it. 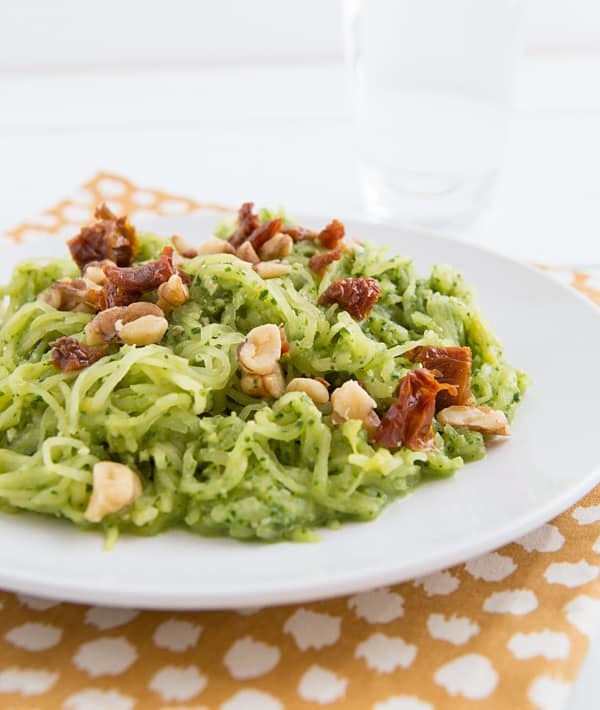 My experience with spaghetti squash is limited….and not very positive…but this recipe sounds very tempting to try it again. The spaghetti squash in the supermarkets here are usually whitish in color and are sold by the pound which tends to make them more expensive. I love yellow squash (almost $2 # this time of the year), also raw zucchini (same price). I have yet to learn the nutritional values of the zucchini or the spaghetti squash. Very little in the zucchini. I believe. What about the spaghetti squash? Kale would add so much. Punched vent holes & turning often……. should probably quit trying to dress it like spaghetti w/some sort of red sauce. It is tasty with butter, salt, & pepper. & perhaps a sprinkling of nutmeg &/or other spices, as it has a very mild flavor. It can be served as the vegetable it is, with legumes, meat entrees, and/or other veggies. We cook our spaghetti squash whole in the microwave and so far its been great. We use Newman’s Own Sockarooni sauce and add lots and lots of roasted vegetables and some Wegman’s “Don’t Be Piggy” sausage crumbles. I cook the sauce until its really thick…usually a double batch and then freeze half. The squash and the sauce taste amazing together….I could eat it every night! I made this last night and when you say “Garlicky” you aint lyin. I might scale back the garlic a tiny bit next time but other than that, this was delicious! I subbed a few things. I don’t like kale so I used spinach, I absolutely HATE walnuts so I subbed pecans and lastly I just wasn’t on board with the calories in 1/4 cup of olive oil so I just used 1/8 cup of water and didn’t miss the olive oil at all! Thanks for this great idea! LOVE the sun dried tomatoes in this. Totally works with the zing of the garlic. Hi, I’ve made spaghetti squash quite a few times but usually with jarred tomato pasta sauce. I like your creative kale pesto and I plan to try it tonight. One quick tip…since I live in Texas, we generally try not to run the oven too much in the summer. It takes 7 minutes to cook spaghetti squash in the microwave. Cut in half, salt/pepper, place one half at a time in a glass pyrex dish (8×8), cover top of the squash with plastic wrap, put about a cup of water in the bottom of the dish and microwave high for 7 minutes. It will be very hot and steamy when you remove from the microwave so be careful but this is a time saver and doesn’t increase the heat in our home. 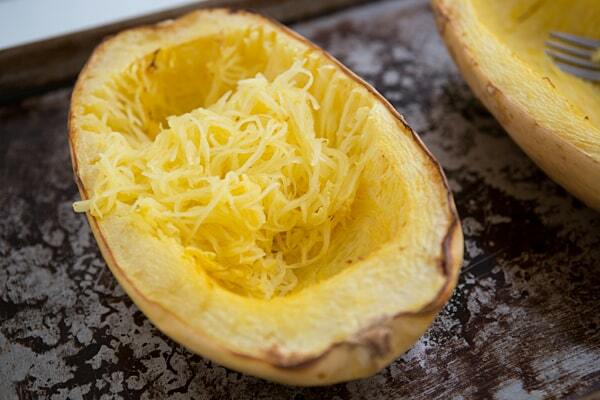 I don’t think I’ve ever seen spaghetti squash in stores during summer, so I’ve never had that problem! 🙂 Usually around here, you can get butternut squash year-round, but acorn and spaghetti squash are a little harder to find. Thanks for the tip for microwaving! I love spaghetti squash. It has such a mild flavor so it pretty much goes with anything. I made and froze a bunch of pesto back in the summer, so I just used that, but the addition of the sun dried tomatoes and walnuts were great! Just as a tip for everyone for preparing the spaghetti squash: it does and always will release a lot of water when it’s cooked, no matter how you prepare it. I read this little trick somewhere back in the day, and it’s always saved my spaghetti squash texture. After I roast the squash, I scrape out the squash into a bowl. I drain as much water as possible, then I throw all of the squash into a preheated skillet. I sautée the squash for about 2 minutes, just to crisp up the “noodles” and evaporate off the excess water. Hope it helps!! I got more than 10 spaghetti squashes in the garden this year, si I was desperately looking for recipes to cook them. I made this last week but reduced the spaghetti squash and added some pasta to make it suitable for my men at home. It was delicious (with almonds instead of walnuts).